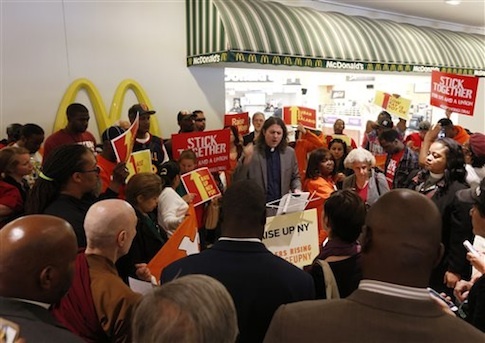 The flacks behind Thursday’s protests over wages for fast food employees have earned millions from unions for their efforts to lighten the pockets of middle class franchise operators. Jonathan Rosen and Valerie Berlin, founders of the eponymous BerlinRosen PR firm, have taken in more than $8 million over the last two years from labor groups that rely on dues payments from workers for operating funds. The Service Employees International Union, which sponsored Thursday’s disruptive protests against fast food franchises, paid the firm about $3 million during that time. The PR shop has been in charge of attracting media attention to the protests. BerlinRosensays on its website that it "developed a strategic communications plan that positioned the campaigns and emerging worker organizing as real solutions to rising inequality." Its employees reached out to reporters to help craft the narrative that fast food strikes represented the interests of low wage workers, rather than labor unions. "When the ground actions took place—the first-ever strikes targeting Walmart, and the largest-ever strike of New York City fast food workers—BerlinRosen amplified the actions nationally, activating a network of engaged and informed reporters to tell the bigger story," the site says. The union paychecks have catapulted Rosen and Berlin into the one percent. Rosen and his wife purchased a $1.4 million Brooklyn condo in 2010. Berlin lives just two blocks away in the exclusive Park Slope neighborhood. She purchased her 2,600 square foot condo in 2010 for $1.7 million. The PR firm’s riches stand in stark contrast to the meager earnings of fast food franchisees, who are typically small business owners that pay large parent companies, such as McDonald’s, to operate under the company banner. These entrepreneurs will be the ones footing the bill for the $15 starting wage that BerlinRosen-backed SEIU activists are demanding for fast food workers. That could be a tall order, according to the National Employment Law Project, a liberal union-funded think tank. "Fast food franchisees themselves are in many cases unprofitable," NELP said in a May report on franchising. A 2012 Franchise Business Review survey of 4,000 franchise owners found that the average franchisee earns a little more than $82,000 per year. However, that figure may be misleading. The report found that more than 50 percent of small business owners earned less than $50,000 in 2011—less than the median U.S. income on the year—while one in three owners earned $25,000 or less. Picketers in more than 100 cities crowded outside of McDonald’s and other fast food restaurants, calling for $15 hourly wages for entry-level work. The protests came one year after demonstrators from Fast Food Forward, a SEIU-funded front group, assembled outside of hundreds of restaurants in 50 cities. The SEIU has spent tens of millions of dollars promoting and orchestrating the strikes through union front groups, such as Fast Food Forward. While the protest campaign has focused on achieving $15 starting wages for fast food employees, the union wants to organize hundreds of thousands of food workers into dues paying members. While the 2013 protests developed outside of business entrances, the labor front groups encouraged "civil disobedience" inside of restaurants during the 2014 protests. Dozens were arrested across the country, including Democratic Rep. Gwen Moore (D., Wis.). BerlinRosen has thus far accomplished its goal of attracting news coverage focusing on fast food workers, rather than union involvement. "Just about every major national media outlet covered the campaigns. … The widespread media coverage of the Walmart and fast food campaigns created a platform that didn't exist just months prior," the PR firm says on its website. The National Council of Chain Restaurants, an industry group representing franchise owners and corporate interests, condemned the "irresponsible" tactics used during Thursday’s protests. "While it is common for labor unions to stage events in order to grab media attention, encouraging activities that put both restaurant workers and their customers in danger of physical harm is not only irresponsible, it’s disturbing. Unions are calling it ‘civil disobedience’ when in reality, this choreographed activity is trespassing and it’s illegal," NCCR said in a statement. "The activities being coordinated, financed and facilitated by labor unions—desperate for new membership dues—accomplish absolutely nothing." Angelo Amador, vice president of labor and workforce policy at the National Restaurant Association, said that he attended one protest in D.C. and encountered paid protestors, rather than fast food workers. He dismissed the effort as little more than a media campaign, adding that it is "becoming more obvious that this is not employee-driven." "It is clearly a concerted effort and not a homegrown-employees revolt. It’s a union trying to do what unions do with dwindling numbers," Amador said. "If it was supported by employees SEIU wouldn’t need to invest $38 million in the campaign, they wouldn’t have to pay protestors, they wouldn’t have to get arrested to get their point across." Neither BerlinRosen, nor SEIU responded to requests for comment. This entry was posted in Issues and tagged Minimum Wage, SEIU, Unions. Bookmark the permalink.